The cozy Adirondack ambiance of the rooms allows participants to relax in a surrounding that contrasts to their busy city lives. Minnowbrook includes three buildings and two cabins that comfortably accommodate up to 56 overnight guests. The cozy Adirondack ambiance of the rooms allows participants to relax in a surrounding that contrasts to their busy city lives. Special care is taken to make sure modern amenities are available in all rooms. The attentive staff is happy to provide any additional assistance needed to ensure a pleasant stay. 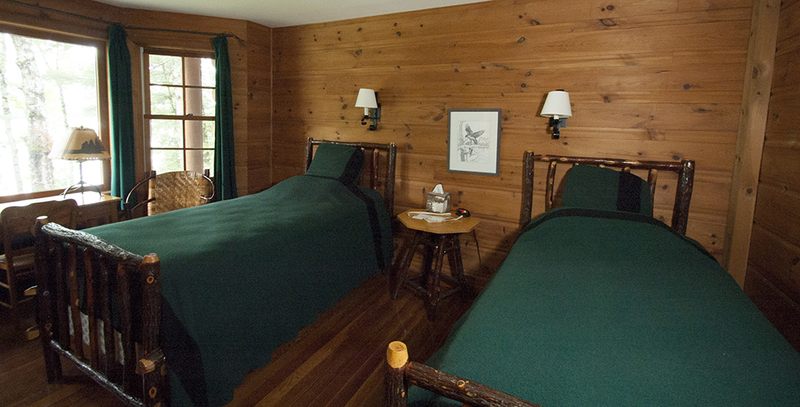 The Main Lodge has 10 double rooms; each room has a private bath. The two main guest rooms have fireplaces. One of these rooms also has a conference table. Rooms on the back of the lodge have a lake view. Pine tongue-and-groove walls and built-in dressers maintain the rustic character of the lodge, while Minnowbrook amenities provide modern comfort. The Lawnhouse offers sleeping quarters for eight guests, including a double room with a loft-style sleeping area. The Lawnhouse offers plenty of places for downtime relaxation in this idyllic setting. The large living room with fireplace and terrace offers spaces for groups to gather, while the small kitchen is available to store snacks. The Greenhouse accommodates 20 guests. The original ice house in this building has been renovated into a fully equipped exercise room. These two cabins sleep four people each. Each boasts a large cozy den with a fireplace. This area is an ideal spot to gather after meetings or to catch up on reading. Each wing of the cabin contains sleeping quarters with two double rooms and a shared bathroom.